She made me buy a t-shirt. And that’s no small feat. I usually don’t do them anymore. I only have one I truly love, it says I <3 SHOPPING! I managed to get through three political campaigns without wearing one. And now I got myself a graphic t-shirt. LOL. 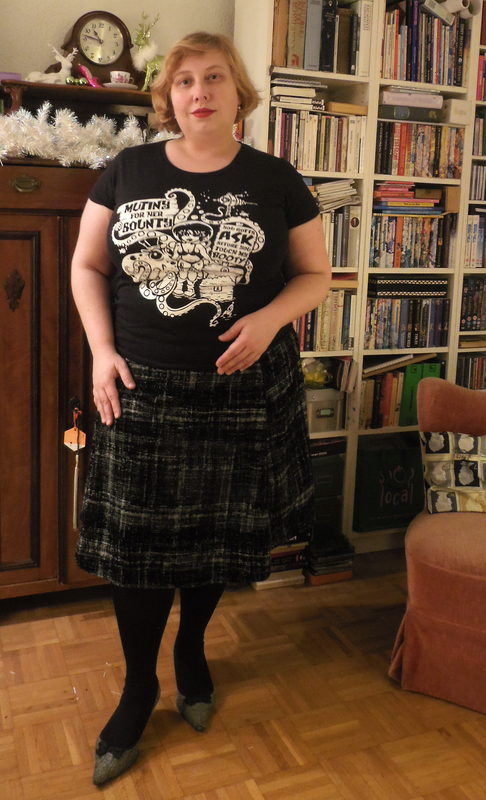 Behind my new t-shirt is Betty Pamper from Pamper and Curves. She looks fun and wild. Her style is glamorously eccentric and edgy. After I started looking for plussize bloggers (prefereably with a vintage twist), she became one of my style icons. Loud and kitsch and classy, all rolled into one. Love the Cherry Dress AND that skull and swirl wallpaper in the background! And then THE t-shirt by Nicky Rockets. And this is me in my new t-shirt. Guess in summer this needs to be worn with denim capri pants and possibly a bandana or an alice band in my hair. 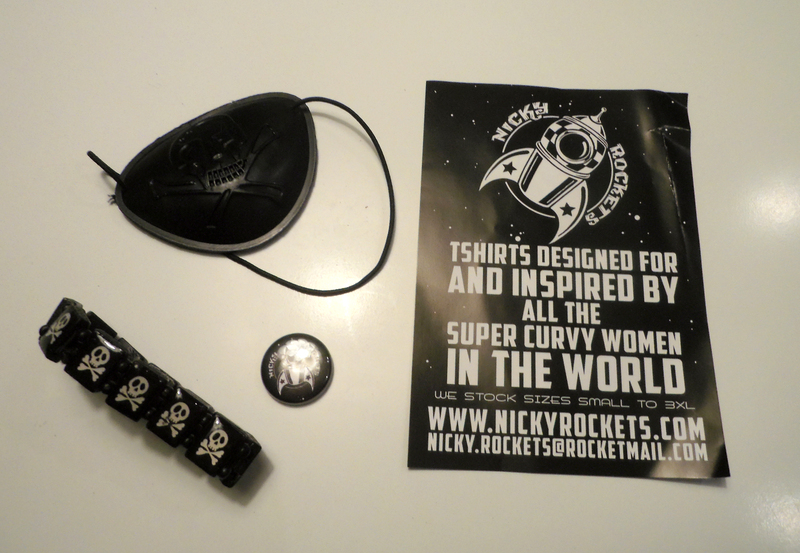 There were also a few give-aways in the parcel – I looooooove the little rocket button! The eye patch and the bracelet with the jolly roger are a hillarious gift for the political me. Dieser Eintrag wurde veröffentlicht in Allgemein und verschlagwortet mit betty pamper, british plus size awards, nicky rocket, pamper and curves, pin-up, plussize, rockabilly, Vintage von RhineBlaze. Permanenter Link zum Eintrag.